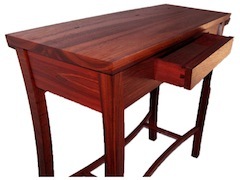 At P’QUE Timber Craft we can custom design a piece of furniture to suit your individual specifications and design. Offering an in home design service we can tailor a design especially for your rooms, either free standing furniture for the dining, bedroom or living areas or built in cabinetry for the home theatre and office. Your furniture is constructed using the latest technology integrated with traditional craftsmanship either in completely solid timber or a mix of solid and veneer to suit all budgets while maintaining a high quality end product. We can manufacture your furniture in any timbers or veneers that are available, from local hardwoods to imported exotics. We also specialize in furniture made from recycled materials and are happy to use any timber that you may own that is of a suitable size and quality to produce a unique piece of furniture with extra sentimental value. The Jarrah Entertainment unit seen in the slider above was manufactured from timber that was salvaged from the original barn built on the clients property in the early 1900’s, creating furniture with history. We are located in the Perth Hills of WA in Midvale and our in home design service is limited to the Perth metro areas however, we can be contacted by phone and email to discuss designs and deliver Australia wide.